Gear shifts in 2000 Honda Accords are composed of four parts: the metal rod that actually shifts the gears, the handle that allows the driver to easily manipulate the gear shift, the button you have to push in to move the gear shift, and the screw that holds the handle and button onto the gear shift. You know how I know this? 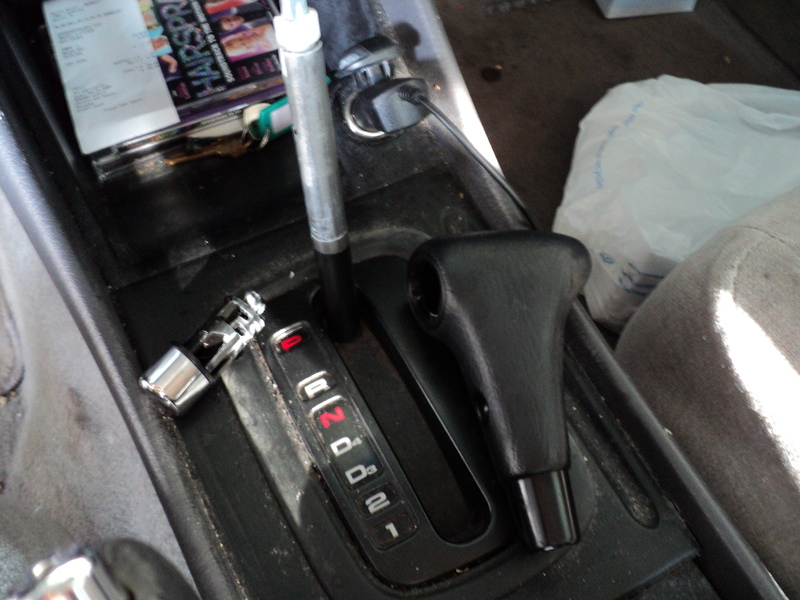 Because last night my gear shift broke apart. No, broke is not the right word. More like my gear shift catapulted apart. A catapulter leaves the ground to fly through the air. The handle sprung off the gear shift and flew through the air, scattering the button and the screw along the way. Of course I was in the parking lot at Mangia Pizza with Andrea in the car reversing out of a spot when this happened. Left to right: button, gear shift, handle. Background: Hairspray. So there I am, stuck in reverse with my gearshift in pieces, and Andrea laughing so hard she’s almost crying. 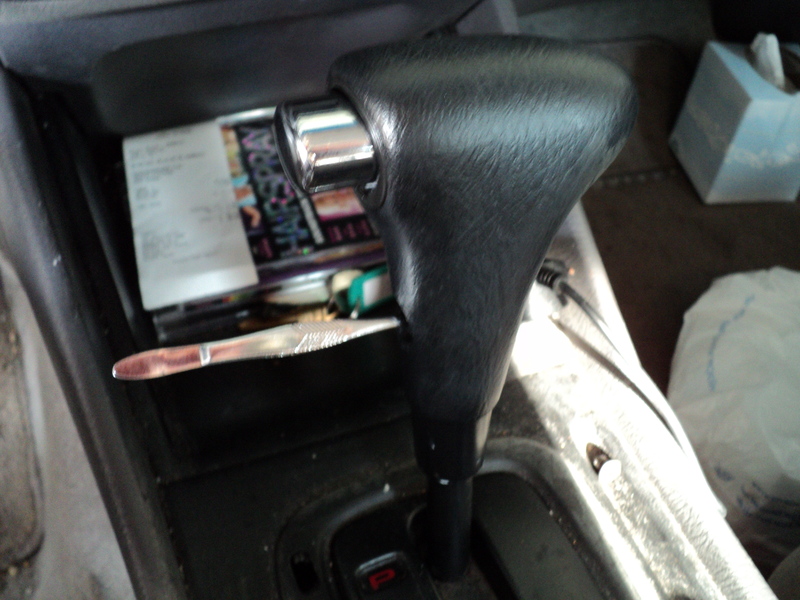 I can’t blame her — the way my gear shift simply scattered itself was downright comical. In between bouts of laughter, I located the screw that had popped over to my door and figured out how the pieces all fit back together. I stuck the screw in the hole where it goes (no jokes, please), and of course the screw is too short for me to use my fingers, my nails aren’t long enough to use as a screwdriver, and I don’t have a screwdriver with me. A pair of tweezers. I simply stuck the prongs of a pair of tweezers into the hole. The prongs provided enough tension to prevent the tweezers from falling out. It worked like. A. Charm. That’s right, folks; this lady used her lady wiles and lady tools to MacGyver herself and her trusty companion out of harm’s way. I fixed my car in the absolute least masculine way possible, and of that fact I am very proud. See the shiny metal thing sticking out horizontally from the gearshift? Tweezers. Andrea said I needed to send this to There, I Fixed It. I suppose I shall. This entry was posted on June 8, 2011 at 8:13 pm and is filed under Uncategorized. You can follow any responses to this entry through the RSS 2.0 feed. You can leave a response, or trackback from your own site. Chick Fix, we need to have a website devoted totally to Chick Fixes! * They have tweezers in their car instead of a screwdriver.